I was in Rome preparing for my perpetual vows in the spring of 2003, when the US and UK led the invasion of Iraq. My abiding memory, in the midst of pain at this decision, is of hundreds of rainbow peace flags fluttering from just about every window, balcony and wall. The rainbow - God's choice to symbolise his enduring covenant - became our choice for symbolising peace, inclusion and rejection of war and division. For our profession ceremony a few months later, in a city still covered in rainbow flags, we asked guests from five continents to bring up our own peace flag and a candle during the penitential rite: these were placed before the altar, as a symbol of our sorrow and sadness, and our hope and desire for something better, founded on peace and love. And today these simple stripes are at the centre of vigils and gatherings, planned and impromptu, throughout the world, symbolising the sorrow and sadness of so many at the horrific shooting in Orlando, and their defiance and rejection of such evil and intolerance. 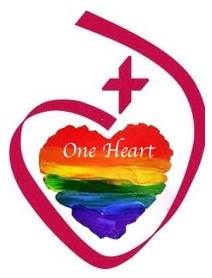 They are also at the centre of so many memes and images on social media, and, thanks to two of our sisters in the US, a rainbow heart is now in the centre of our congregational symbol of the world in the Heart of God. Looking at this heart it occurs to me that there is no black or white in a rainbow, only a spectrum of colours, nuanced and blending easily into each other. No extremes, only the beautiful harmonious blend which lies in between, complementing and enhancing their neighbours - here all held and embraced within the Open Heart. Could we dare hope, pray and work for a world like this? What can we do to bring this about? A few hours ago I also saw these words on Facebook, attributed to Pope Francis. I don't know whether he said them today or after an earlier horror, but they are certainly a call and a reminder of the most powerful way to combat hatred and division, and transform grief into the most potent and compelling response. Our infinite sadness can only be cured by infinite love.